The author with his fly-fishing instructor, Maddie. The week before I started my internship with Trout Unlimited, I had the opportunity to learn fly fishing for the very first time. I had the honor of receiving guidance from a true master. Her name’s Maddie. She’s my girlfriend. With a straight face he said, “Because they’re so dumb they’ll hit a brick if you toss it in the water.” That was the only explanation I needed. For the next 21 years and 6 months, I fished exclusively for bass. 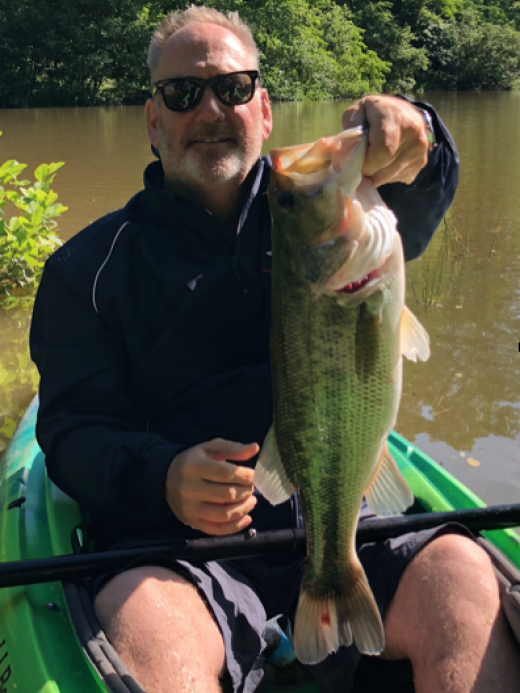 Jeffrey Constanz’s dad with a nice largemouth. This past Fourth of July week I went on vacation to the backwoods of Maine with my family. My uncle, as an employee of L.L. 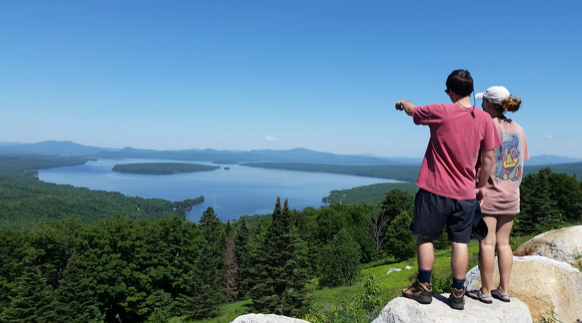 Bean, won a lottery that allowed my family to stay in a perfectly outfitted log cabin next to Rangeley Lake––a gorgeous 6,000-acre body of water in the Western Mountains. It was the perfect opportunity for me to explore fly fishing before my internship with Trout Unlimited (and thus, impress my new bosses). I had heard a lot about fly fishing, but it seemed cumbersome and unnecessarily complicated. Why not relax and give yourself a chance to sip a cold beer? Nevertheless, I set out to fish South Bog Stream with Maddie. I quickly experienced the magic of casting with rhythm. 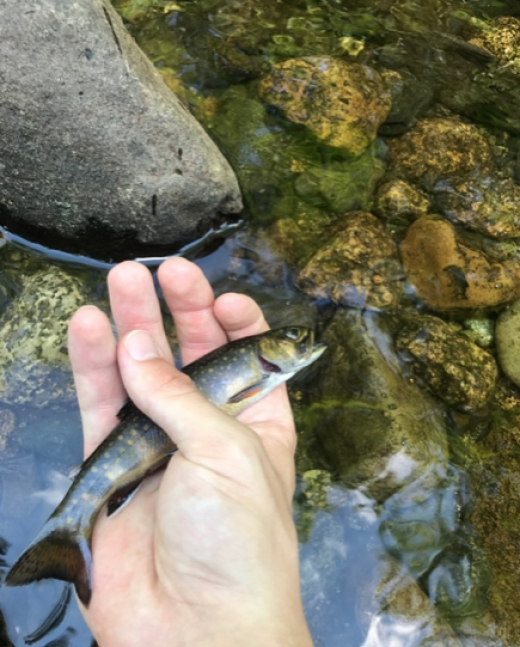 I hooked into two small brook trout on my first few attempts. I was so giddy after catching my first “brookie” (angler talk for “brook trout”) that I asked Maddie to take a picture of me. Not the other way around. And I’m not a big picture person. The next brook trout that I landed (angler talk for “caught”) was a little more sizeable. That’s the photo that I feel proud to show others as a representation of my first attempt at fly fishing. A nice Maine brook trout landed by the author. Fly fishing was a whole new world of fishing that I hadn’t explored. Maddie learned how to fly fish from her dad, and she taught me––for you seasoned veterans out there, bear with me––that trout are intelligent, spooked by our shadows, and sensitive to human smells. That us humans have to take serious precautions not to scare them off, and that some enthusiasts even recommend anglers rub mud on their hands to cover up their scent. I was fascinated. I’m used to fooling a naive bass or two with whatever was lying around in my dad’s tackle box. That approach doesn’t fly with trout (pun semi-intended). In Maine, I felt like a secret agent: I was cognizant of which way my shadow was falling, I stepped on rocks carefully to not disturb fish, and rubbed my hands in the mud to mask my scent. I was full blown Navy Seal. Minus the technical skills. Or conditioning. Or mental fortitude. Regardless, I had a blast. I used to think the learning curve for fly fishing was too steep to bother, but I saw improvement in every cast. I couldn’t help but think: I just wish more people could have opportunities to learn to fly fish and to experience the joy that I did. In our country, 30 percent of all active and passionate fly fishermen are women. 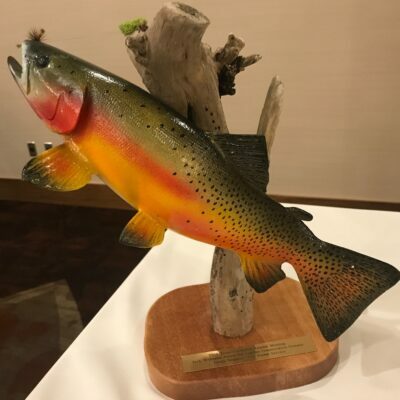 However, the membership of Trout Unlimited is only 6 percent women. How can this be? Maddie and I are part of the new generation of conservationists. Hopefully, we can work together to provide the next generation with opportunities like the ones I have had. 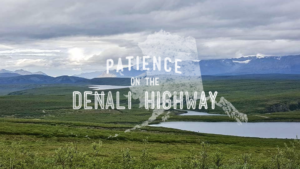 To spend time with nature, and to learn firsthand just how much it’s worth fighting for. I know, your head must be spinning: What are the solutions, Jeff? Guide us! Well, I’m just a lowly intern. 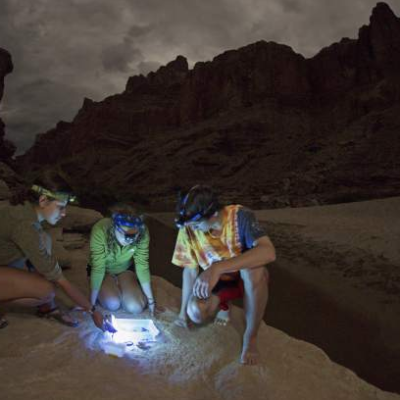 But I’ll leave you with this–––whoever reads this article, I call on you to expose one young person to the outdoors that wouldn’t otherwise have had the chance. 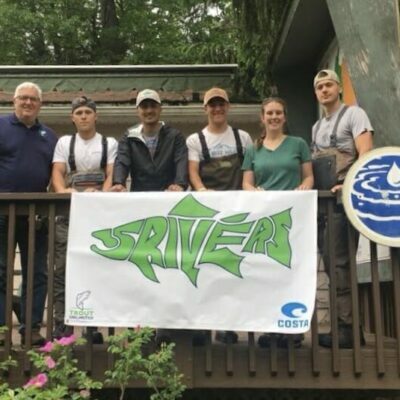 I see this as a practical way to cultivate the next generation of conservationists, and to grow the circle of people who call themselves Trout Unlimited members––thereby breaking through our current demographic limitations. But what do I know? I’m just an intern. Jeffery Consantz is a government affairs intern at TU. He works in our Arlington, Va., headquarters.